I hadn't seen one of my friends for a long, long time... as she had been away in Europe trying to pursue an interest outside of banking. Having finally faced up to reality, she recently returned to Hong Kong and rejoined her former employer, although she was lucky enough to be able to kinda combine her interest in art into her new position. I thought it was high time that we caught up with each other, and made plans to return to Upper Modern Bistro for brunch. I have been remiss in not visiting my old friend Philippe since my first visit last year, and since then another old friend Jeremy - formerly of Caprice - has joined Philippe. I, along with a number of others, was overjoyed when news came a couple of months ago that Jeremy would not be leaving Hong Kong. This meant that Hong Kong would get the keep one of its most seasoned mâitre d'hôtels, and we would have our supply of Jeremy's amazing selection of cheese! I greeted Philippe in the open kitchen soon after I walked through the door, and Jeremy came over not long after I was seated. It's good to see my old friends! What was immediately apparent was the improvement in the level of service - which had been a source of complaints judging from the feedback I've gotten from friends. We received a warm batch of bread, and right away one can see little touches from Jeremy. Pig trotter and oyster toast - diced pig trotter confit, with black beans, poached oysters and topped with chopped green herbs and Parmesan bread crumbs. I could pick out the distinct flavors of cumin, and I think there were a couple of drops of truffle oil. Pretty interesting mix of ingredients, and surprised at the use of black beans... especially since white beans is more common in traditional French stews. I was also surprised that the oyster ended up dominating the flavors. Then we let Jeremy loose and unleash the cheesy onslaught. Of course Jeremy never disappoints... and my friend was suitably impressed. Brillat-Savarin fermier - my favorite triple-cream. Sooo creamy and melt-in-your-mouth, and nice acidity here. Croix Cathare - goat's milk cheese made by monks. Very thick and creamy, nice and rather subtle in terms of flavors. Briquette de Joursac - from Aveyron. Pretty high acidity here, pretty nutty and strong "goaty" flavors. Very thick and solid in terms of texture. Louvie-Juzon - goat's milk cheese from the Pyrénées. The pungent, goaty flavors were much heavier here. Acidity was there on the palate, and the rind was very bitter. Coup de Corne - from the same monks who made the Croix Cathare. Nutty with a little ammonia, especially evident with wine. Bitter finish. Coulommiers - a little salty, kinda nutty with a slight bitter finish. Comté, millesimes 2010 - nice and full-bodied. Sweeter and more moist than expected, with complex layers of flavors. Époisses fermier - nice and runny, bitter, very nutty and really salty on the finish. Fourme d'Ambert fermier - very salty as expected, and the mineral flavors really came through. Jeremy also very kindly provided us with some apricot and mixed berry jams. These were absolutely complementary to the savory and creamy cheese. We weren't looking to have any wine, as we both had engagements after lunch, but I guess that just wasn't gonna fly with Jeremy. He very kindly poured us a glass to go along with the cheese. 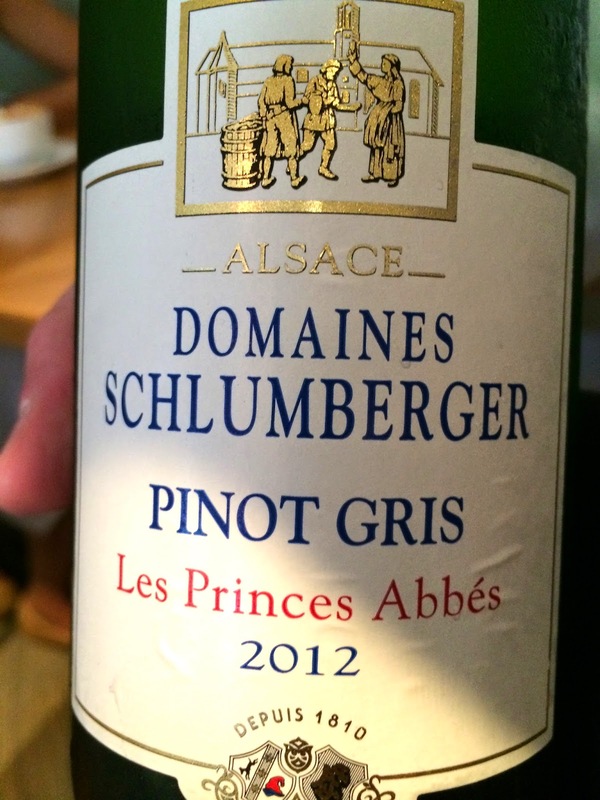 2012 Schlumberger Pinot Gris Les Princes Abbés - nice and fragrant, slightly ripe on the palate, very round body, with a hint of bitterness on the finish. Very refreshing. My friend and I were very, very full after the barrage of cheese. I'd say that we made a pretty good dent, and other than the Comté and Fourme d'Ambert, there wasn't much left of the others. I ended up packing the leftovers... and was determined to make an 8-cheese grilled cheese sandwich for tomorrow.